I was wondering about the web last night when I became aware that the term “Working Schooner” might be in danger from copy writers in Hollywood. Due to the recent popularity of certain Disney movies, what were formerly honest working vessels are being converted to “Pirate Ships”. Instead of hauling cargo, carrying paying passengers, or catching fish, a bunch of schooners have become theme parks littered with fake pirate paraphernalia. Middle class America has caught a mania for things pirate, which seems really shallow thinking at best. I’m not against a joke or a bit of play acting, but at the same time if working schooners (and the way of life that goes with them), are to continue indefinitely, the ships and their crews must be treated with respect. As long as a boat is only the backdrop to foolishness that respect will be eroded. 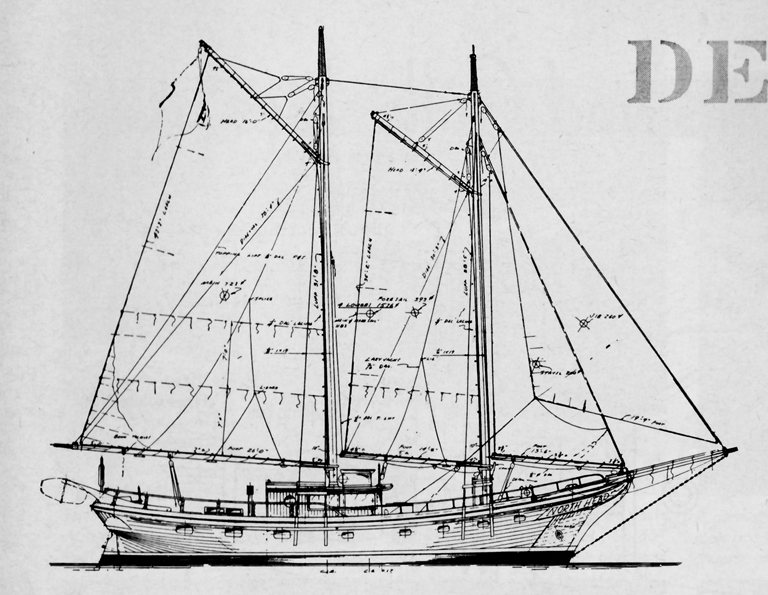 I believe the Maine “cattle schooners” are a good example of where working schooners can thrive. No one dresses up, the attraction is the history, technology, and hard work involved in actually sailing large vessels with no auxiliary engine through rocky and fogbound islands. It is experience enough to savor the silent entrance of a big schooner and watch her come to anchor for the night. This transports one out of our daily scramble for another dollar and another phone call. It’s a visit with simple but hard requirements, those of shelter, heat, and food, and dealing with the effects of the weather, tide, currents, and wind. A world foreign to average suburbanites, yet a world of apparent fascination judging by the lineups in Camden all summer. Of course I would really like to see new development of sailing cargo ships, and I believe this is possible though the great weight of bureaucracy and trucking subsidies is against it. Transport of anything by water at low speed is by far the most efficient and “green” or sustainable method that we know about. Many studies have shown that Mississippi barge freight is multiple times cheaper than truck transport. Yet we persist in building more roads and drilling more oil wells. Offering subsidies to build sailing freighters and creating systems to move people efficiently by water could be a huge growth industry, an industry that includes the romance and adventure our wishful “pirates” seek.